After the FOCA teams had boycotted the race at Imola, a compromise was found at a meeting in Casablanca and so the teams were back together again at Zolder. There was trouble at Ferrari as Gilles Villeneuve had sworn never to speak to his team mate Didier Pironi after the Frenchman snatched victory from Villeneuve at Imola, against team orders. Villeneuve was also furious that some of the Ferrari management supported Pironi. With 32 cars entered there had to be a pre-qualifying session and this got rid of Riccardo Paletti's Osella and the March of Raul Boesel. In the final minutes of qualifying on Saturday Villeneuve went out to beat Pironi's best time, the two being separated by a tenth of a second (although Pironi was only sixth overall). The Canadian came up behind the slow-moving Rothmans March of Jochen Mass and took a split-second decision to pass the German on the right. At the same moment Mass, trying to get out of Villeneuve's way, also moved to the right. The Ferrari rode over the back of the March, flew through the air and landed nose-first on a bank beside the track. The car was then torn apart in a series of violent cartwheels. Villeneuve was clinically dead from the first impact but his body was hurled from the car into the catchfencing on the other side of the track. Doctors gave him heart massage during the rush to hospital in Louvain and he was then kept alive with life-support machinery until the evening by which time it had become clear that there was no hope. The Ferrari team packed up and went back to Italy but the race meeting went on. The two Renaults of Alain Prost and Rene Arnoux had qualified on the front row with Keke Rosberg (using the new Williams FW08 for the first time) was third ahead of Niki Lauda's McLaren, Michele Alboreto's Tyrrell and the Alfa Romeo of Andrea de Cesaris. Then came Nigel Mansell (Lotus), Nelson Piquet and Riccardo Patrese (back in the BMW turbocharged Brabham BT50s) and John Watson (McLaren). In the race Arnoux got ahead of Prost at the start and was followed through by Rosberg and so Prost lost ground to Arnoux as he tried to find a way to pass the Williams. But Rosberg responded and began to close on Arnoux. On the fifth lap the fight was over. 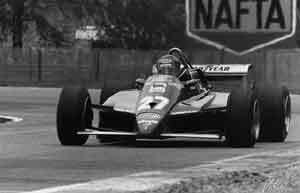 Arnoux slowed and went into the pits with a turbo problem. Prost was also in trouble and had dropped behind Lauda and de Cesaris. He would later be overtaken by Patrese and Watson and Alboreto. It was not until lap 29 that there was a change at the front when Lauda was held up by a backmarker and lost second place to de Cesaris. Six laps later the Alfa disappeared with transmission failure and so Lauda was back in second. Behind him Watson had got ahead of Patrese and began to close on Lauda, the Ulsterman using a harder tire compound than the Austrian. Watson went ahead on lap 46 and set off after Rosberg. On the penultimate lap Rosberg, struggling with worn tires, went sideways and Watson dived into the lead to take victory. Rosberg came home second with Eddie Cheever third in the Talbot Ligier. The remaining points went to Elio de Angelis (Lotus), Piquet and Chico Serra (Fittipaldi).